As our valued guest you can have access to an unbeatable variety of recreational activities that is difficult to find elsewhere in one destination! Created to entertain, engage, educate and excite, they ensure that you and your loved ones can maintain a dynamic, productive and healthy lifestyle even while on a holiday or away from everyday routine. Those with families will also enjoy our fully-equipped kids club together with our games and karaoke room. In addition we can provide babysitting service so parents can have their rest. For the active people there is an exceptional sporting facilities, unlimited outdoor meeting spaces, endless recreational entertainment, relaxing spas and delectable around the world cuisine, we have everything you need for an all-inclusive luxurious trip to get away from it all. For more information or to book any of the activities, please contact our Guest Relations at (+66) 38 250 421 ext 2037 or email: gro-main@royalcliff.com. Are you looking for a fun way to burn calories and interact with others outside of the gym? Don't miss this chance to join Cardio Tennis, a fun group fitness class set on the tennis courts of Fitz Club – Racquets, Health and Fitness. Supported by music and a beautiful qualified tennis instructor, you'll get to hit a lot of tennis balls during the class and have a great cardio workout at the same time. It includes a warm - up, cardio workout and cool down phase. Open to all ages and abilities, the fee is THB 300 per person per class for Fitz Club members and THB 400 per person per class for non-members and all hotel guests. Hurry and book your place now! To join our Cardio Tennis class, please contact Fitz Club reception at (+66) 38 - 250 -421 Ext: 2621, 2622 or email: fitz@royalcliff.com. Enjoy the finest treatments and therapies carefully selected from around the world in our Cliff Spas located at the Royal Cliff Grand Hotel and the Royal Wing Suites & Spa. With 18 luxurious treatment suites, take this opportunity to soothe away your stress or simply spoil yourself in total relaxation in tranquil surroundings. Treat yourself to the Lomi Lomi Nui, a traditional full body healing technique from the Hawaiian Islands. Each nurtured stroke rebalances vital energy flow and lulls the mind into a relaxing state. Indulge in this 120-minute flowing rhythmic massage which imitates the motion of soft waves along with a treatment set of your choice. Available for only THB 4,300 net per person per session and THB 8,000 net per couple per session, try this exciting promotion now! For more information, please contact Cliff Spa at (+66) 38 250421 Ext. 2828/2829 or email: cliffspa@royalcliff.com. 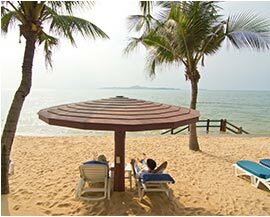 We are the only resort in Pattaya with 2 private beaches reserved exclusively for our hotel guests. For those who love photography, our beaches offer the best view of the surrounding islands. You can enjoy the cool breeze, soak in the sun and relax with your favorite cocktail. They can also be used for events, dinner functions and special occasions. Food can be ordered from Breezeo - Be Yourself Dining, our popular beachside restaurant. Water-sports including sailing, wind surfing, jet skiing, banana boat rides and para-sailing can be arranged. Funtasea - Kids World is the best "edutainment" centre in Pattaya. 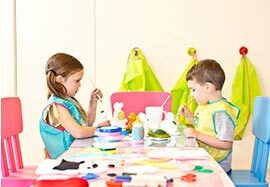 With over 200 square meters of indoor play area and featuring a wealth of resources, toys and fun activities, it is a modern interactive environment for children between 2-11 years old. With an exciting selection of activities to enjoy and a fun, dynamic space for the little ones to explore, Funtasea is a perfect kids zone and a great way for parents to indulge in a memorable and worry-free vacation! For more information, please contact Funtasea - Kids World at (+66) 38-250421 ext. 2064 or emai: funtasea@royalcliff.com. Our health and fitness centre houses a state of the art gym with equipment for fitness training, toning, strength building and cardiovascular exercises. The club recently installed 16 brand new cardiovascular exercise machines which feature an Ipod dock and cable TV. These are ideal for a good workout and are complemented by the availability of our sauna and steam rooms and free-form swimming pool. For more information, please contact Fitz Club reception at (+66) 38 - 250 -421 Ext: 2621, 2622 or email: fitz@royalcliff.com. Learn how simple it is to cook delicious local favourites. Our cooking classes offer an ideal home-style learning environment with the guidance of our master Thai chefs. We have a nursery herb garden within the property where participants can pick up the freshest seasonal ingredients for their dishes. Discover the uniqueness of uniting various herbs and spices and join us for a culinary adventure delightfully exploring Thailand's traditional cuisine! To book a class, please contact our Guest Relations at (+66) 38 250 421 ext 2037 or email: gro-main@royalcliff.com. Special classes for children are also available. Buy your tickets to popular Pattaya attractions right at the resort and avail of special benefits that are exclusive for Royal Cliff guests only. 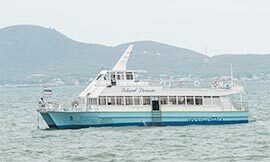 You can also explore the charm of the nearby islands by booking our "Island Dream" catamaran. Our partner tour company, SCT Tours, can assist with different sightseeing options. For more information, please contact our Guest Relations at (+66) 38 250 421 ext 2037 or email: gro-main@royalcliff.com. 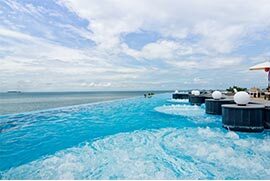 We have 7 swimming pools including 2 stunning infinity edge pools overlooking the bay. 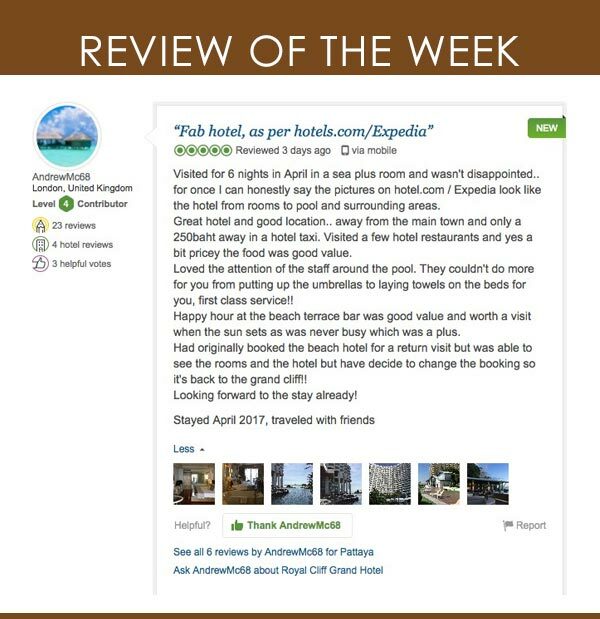 Our pools have been included in the top 10 best swimming pools in Thailand and have been acclaimed by multiple bloggers, media personalities and awarding bodies from around the world. 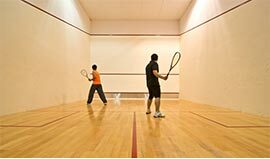 With our 7 well-appointed plexipaved Tennis courts of Grand Slam standards and 2 air-conditioned Squash courts, you are sure to have the best Tennis and Squash experience! Qualified coaches are available for individual or group coaching. 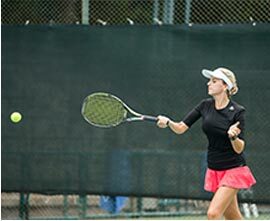 Kids Tennis camps are available upon request. To book the courts, please contact Fitz Club reception at (+66) 38 - 250 -421 Ext: 2621, 2622 or email: fitz@royalcliff.com. An excellent form of exercise and an exceptional cultural experience, we invite guests to learn Thailand's celebrated and ancient martial art at Fitz Club - Racquets, Health and Fitness. A private instructor can be arranged upon request. To book a lesson, please contact Fitz Club reception at (+66) 38 - 250 -421 Ext: 2621, 2622 or email: fitz@royalcliff.com. 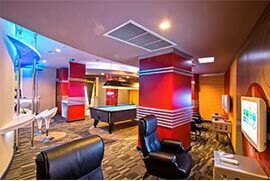 Featuring interactive elements such as game stations, pool table and a new karaoke lounge, this is the perfect place to kick back, relax and spend an exciting day with your family and friends. A food and drink menu featuring delicious snacks, light bites and premium drinks is also available. For more information, please contact The Verge – Games, Pool and Karaoke at (+66) 38-250421 ext. 2007 or email: theverge@royalcliff.com.